It can be very fun to dress your pet friend into cute little clothes, but you also have to think about its comfort and whether it fits your dog. You also have to think about the cold and rain, so it is best to buy clothes of good quality. Here are 10 best Pomeranian dog clothes. The very best on this list is this raincoat that will keep your dog dry during rain. It is four legged raincoat with waterproof hoodie. You can use buttons to take it off from your pet friend without trouble, and since it is made out of quality material, it can protect your dog hair. Recommended weight is from 5.5-9 pounds. Your pet friend will be safe and clean, and you will love the way it looks in it, so it is the win situation for everyone. This model is not only warm, but also very stylish and it is made out of blended wool fabric with twill overcoating. It has quilted polyester interior and acrylic fur hood lining. As for the closure goes, it has snap-on button closure and your dog will feel warm and safe in it. The only problem, according to customers, is the fact that you have to order a bigger size than you actually should because they are too small. Soft, warm and sweet looking, what more can you ask from a dog jacket? It is made out of fleece material, so you can wash it in a machine, and added plus is the fact that is very easy takes care. 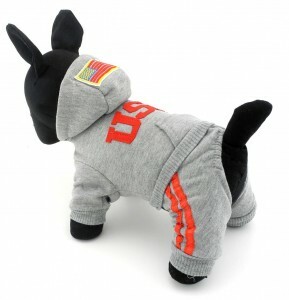 It is very small, so probably the best thing is to take measurements of your pet friend before buying this jacket. If you decide to buy it, keep in mind the fact that it will keep your dog very warm, while it will looks stylish. What more can you ask? According to many satisfied customers, this model fits very well and it is nicely made. It isn’t so thick like the sweater, but it is also not thin, so your dog will feel warm and safe in it. It comes in a little bit smaller size than other dog clothes comes, but because of that you have to measure your pet friend and find the size that perfectly fits. Since it doesn’t go on back legs, your dog will not make it dirty from sitting down, and that’s a plus. This model isn’t for a cold, rainy weather, but it will look very nice on summertime. It has printed Security on the back, so your dog will make people smile wherever it goes. You can wash this cloth in machine, since it is made out of ribbed cotton material. It is very durable your pet friend will love wearing it. If you want your dog to look cute, then it is perfect. Dress your pet friend to look fearless! This military jacket will look excellent on your pup, and both you and your pet will love it. It is made out of fleece material so you can wash it in machine, and even after few washings, it will be soft and warm. The only problem is that it is a bit small, so you will have to take measurements of your pet friend before buying it, and if your dog has heavy hair, make sure you buy a larger size, so it will fit perfectly. Made out of fleece material, this super soft and warm coat is very easy to care, and you can wash it in the machine. It looks adorable, and it will be a perfect gift for your pet friend in a cold weather. It comes in small sizes, so you have to know the measurements of your pet, so you can choose a good size. In this 10 best, I recommend this model the most, because it is warm, and very nice looking, but comes in pink color, so if you have a boy dog, it won’t probably be his color. The price of is nice, and it will pay off. This model your pet friend can wear anytime he likes, because it is soft and very comfortable. You can wash it in the machine, so it is easy to take care for. You will get full costume and it comes in pink, red, gray and black color, with color varieties when it comes to USA writing on the back. The manufacturers are saying that you should pay attention to the size of your dog, because sizes comes a little small, so you also probably don’t want to make a mistake. This cute little pink dress will look adorable on your pet friend, and you will love it, and your dog will love the attention that it looks so cute when you fluff the layers on the tutu, and material are cotton blend and grenadine, and the color is pink, so you will have to skip this tutu if you have a boy dog. Some of the customers were not satisfied, though, because the dress wasn’t fluffy, but you can do it yourself, and it will look great. 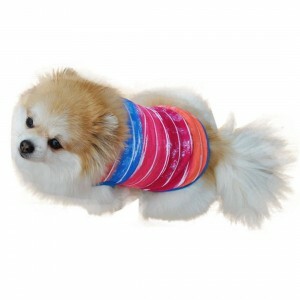 Made out of high quality cotton, this model will make your dog look perfect. You can put in on your pet friend when you are out walking, jogging, hunting, or some other outdoor activity. It will make your dog look stylish and feel warm. It will make your dog feel comfortable and it will allow moving wherever it wants, because it doesn’t have sleeves, so non restrictive movement is allowed. Perfect for a summer time. Finding perfect clothes for such a small dog can be really a trouble, and finding a good model, the one that has quality and durability, but also good price is much, much harder, so I am hoping that this 10 Best Pomeranian Dog Clothes list made the choice much easier.